The Impinger II Express Oven from Lincoln comes with the convenience of keeping hot air in contact with food surfaces at all times, allowing for heating, cooking, baking and crisping food that is two to four times faster than a conventional oven! And now, there is no need for the energy-consuming, expensive, and noisy ventilation system or hood! Cleanup is super easy too, as the front conveyor is removable. The Impinger II Express comes in single or double stack, and has all the same great features of Lincoln’s electric 1100 Series oven. It’s also an ideal solution when there just isn’t enough room under an existing hood. Temperature is adjustable from 250°F (121°C) to 575°F (302°C). 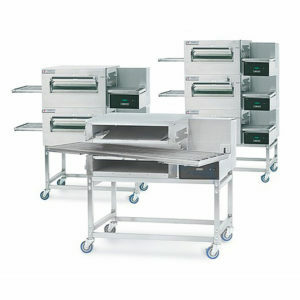 Conveyor speed is adjustable from one (1) minute to thirty (30) minutes cooking time.